While Gian Villante is one of the most intense competitors on the UFC roster on fight night, on any other night, the Long Islander is as laid-back as they come, quick with a laugh or a self-effacing joke as he searches for the next good time. So it’s not much of a surprise that as he prepares to receive another round of “Uh vai morrer,” aka “You’re gonna die,” from Brazilian fans before he faces Mauricio “Shogun” Rua in Fortaleza on Saturday, he’s not too rattled. In the great scheme of things, it’s really the only way for Villante or any non-Brazilian fighter to react when fighting in front of some of the sport’s most diehard fans because the bottom line is, those fans won’t be in the Octagon when the gate shuts. There’s a fight to be fought, and that should be the only focus. And it is for Villante, even though he is fighting an MMA legend in Rua. But that’s the fun part for him, so what is he concerned about this weekend? “Hopefully it’s not too hot in the arena like it was last time,” he said, referring to his last business trip to Brazil, a 2014 bout in Natal against Fabio Maldonado. Villante lost that grueling three-rounder via decision, but he’s since won four of his next six, with three of those victories over Sean O’Connell, Corey Anderson and Saparbeg Safarov earning him Fight of the Night honors. In a 205-pound weight class in need of rising stars, Villante fits the role perfectly, and a win over a former world champion in Rua would cement that status. So this is his biggest fight ever, right? Maybe this is why Villante is able to keep everything on an even keel. He has been on the UFC roster since 2013, he has had his wins, he has had his losses, and he’s still here. So while “Shogun” is still an imposing name and one Villante admires, he still has to fight him, and it doesn’t get more cut and dried than that. For some, that’s just talk. For a guy like Villante, if he says he’s looking to brawl, he means it, as much as his coaches may be losing hair over his propensity to dump the game plan and start slugging the first time he gets hit. Then again, Rua made his name in the sport with such an attitude, setting the stage for what may be one of the best fights of the first quarter of the year. And as uncomfortable as Villante and Rua are going to make each other once the fists start flying, there is an odd comfort in seeing two athletes in their element. Most people, even professional prizefighters, wouldn’t want to fight “Shogun” Rua, let alone stand in the pocket and trade with him. 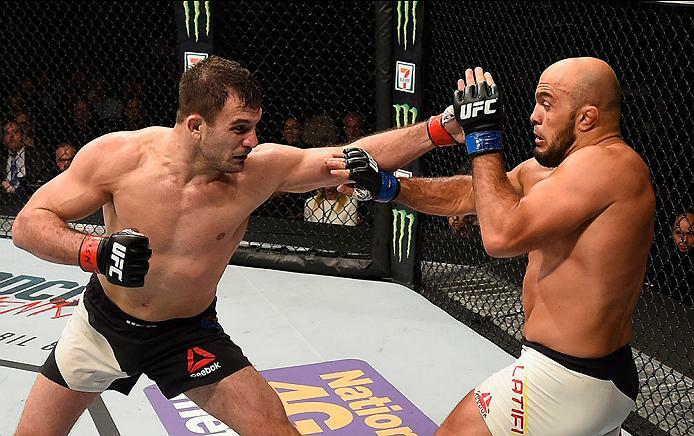 Villante is cut from a different cloth, and that makes him a special fighter. If he wins, the rest of the world will know that too. If he doesn’t, well, he’s not thinking that far ahead, win or lose. He laughs, knowing that, despite that statement, when his name is called, he fights. That attitude may get him a world title, it may not, but in the meantime, he’s going to make sure he brings the fans along for those good times in the Octagon.